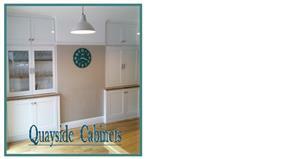 Quayside Cabinets - Bedrooms, Carpenter, Kitchens based in Christchurch, Dorset. At Quayside Cabinets we offer bespoke cabinetry and fitted furniture for all aspects of your home. From your initial idea, we design, make and fit your project keeping you involved and informed throughout. We are unique in that we do not have the limitations of working from a catalogue of products, we provide a completely bespoke service. Quayside Cabinets is a local, friendly and reliable service where quality craftsmanship and customer satisfaction are our priority.